Do you know what my favorite part of blogging is? It’s y’all. You guys. My readers. I love that I can write about my life and projects and you guys just keep coming back for more. The absolute best e-mails I get are from readers showing me a project they competed after being inspired by something on my website. It makes my day, every single time. So I thought I would put together a post showcasing some projects I have been sent recently. I love seeing reader projects and figured y’all would want to see what everyone else has been up to. These are great and totally deserve to be spotlighted. Also, I think I may put together a reader projects post every few months, so if anyone has projects they would like to send me for a feature please do! (Though they do need to be projects that we’re inspired by something you saw on Domestic Imperfection.) I will need one or two pictures of the finished project, your name, and a sentence or so about it, which project inspired you, and if you are a blogger a link to your post. 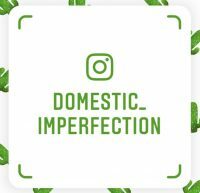 Please e-mail all submissions to domesticimperfection at gmail dot com with the title “reader project”. First up we have Jen from Ohio. 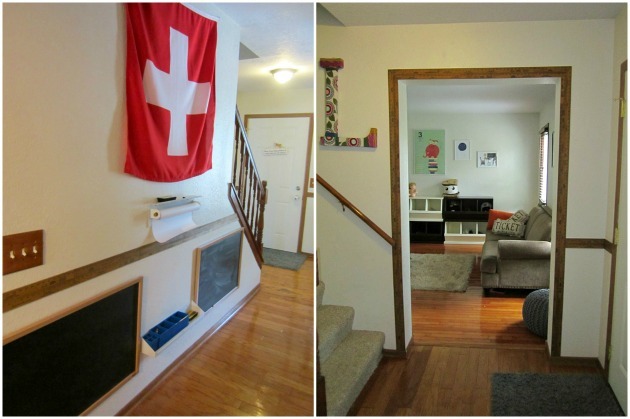 She saw the yardsticks I used on the kids stepstools and ran with the yardstick idea…she used yardsticks as moulding! Also, can I just say how much I love those chalkboards? Such a great idea. 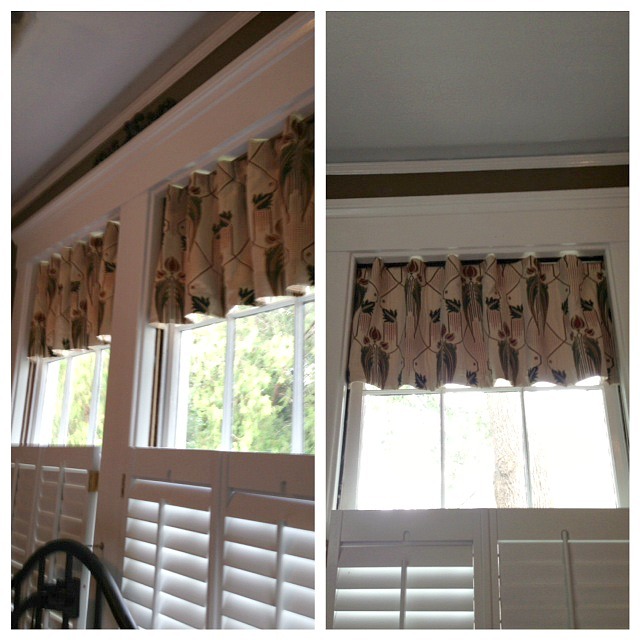 Margie used the instructions from my back tab curtains and make herself a valance version. They look great in her windows, which were beautiful to begin with. 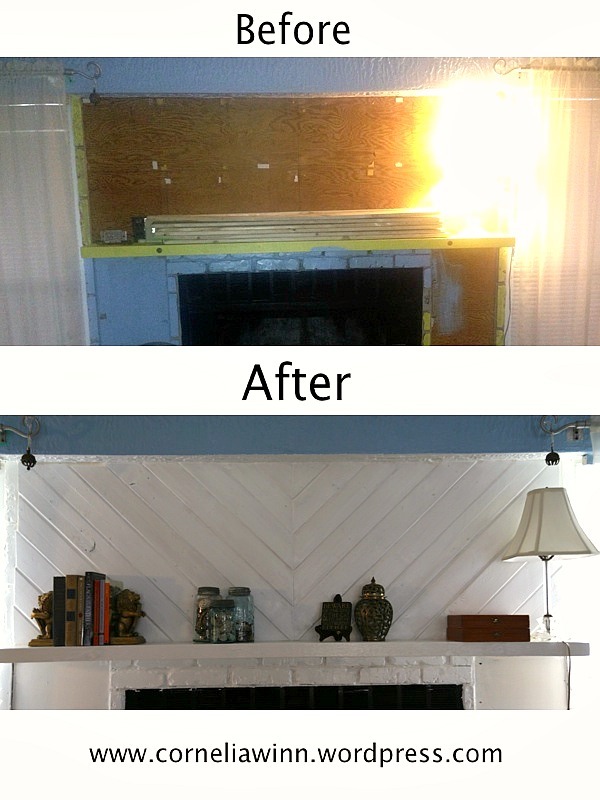 Cornelia of Two Thumbs liked the planks in my kitchen and created her own version over her fireplace. I love that she put her own spin on it by placing then at an angle, such a great before and after! 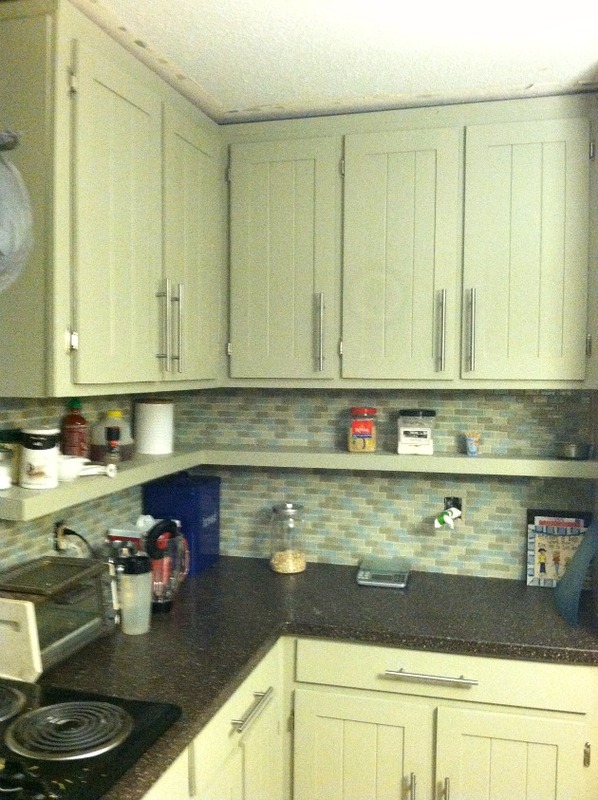 Next up we have Laura, whom I am giving some serious props for being the first person (that I know of) to raise her cabinets and add a shelf. 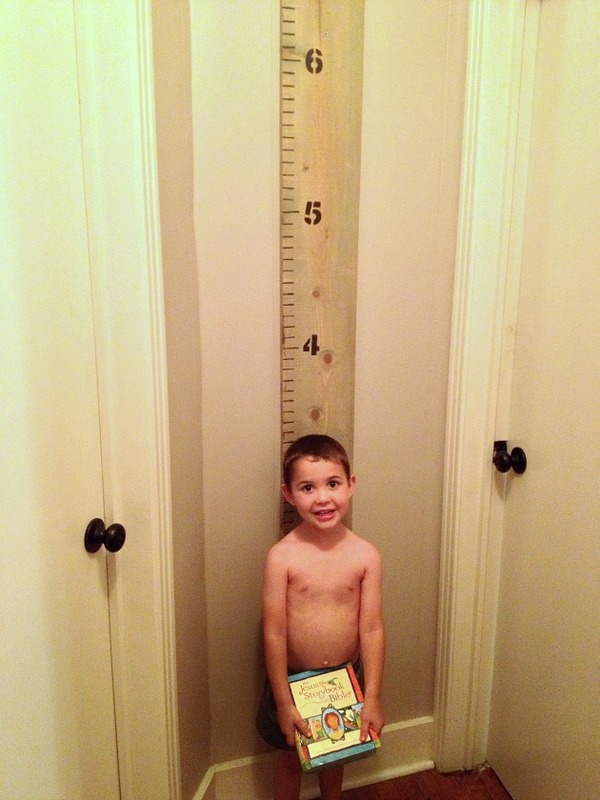 Kristina followed my growth chart tutorial and whipped up a growth chart for her adorable little man. 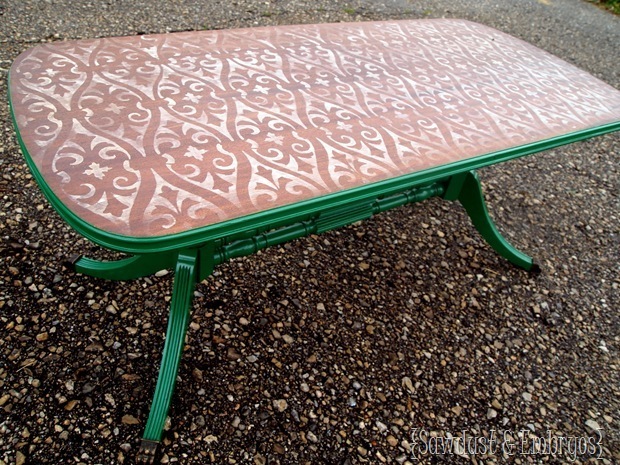 Next she said she’s taking on a penny project and stenciling a table! Hannah took inspiration from my penny countertop and created a beautiful penny tray. She even added some character and age to some of her pennies by sponging them with a little turquoise paint. Love it. Molly from Texas took inspiration from my birch forest hallway and decided to stencil an accent wall in her bedroom. She used Annie Sloan Chalk paint (duck egg blue and cocco) and the interlacing leaves stencil from Royal Design Studio to create this stunning wall. If you’ve ever stenciled a wall before then you know that this was a labor of love. Diane at Tales from a Sears House bought this table from craigslist because she wanted the four chairs that came with it. 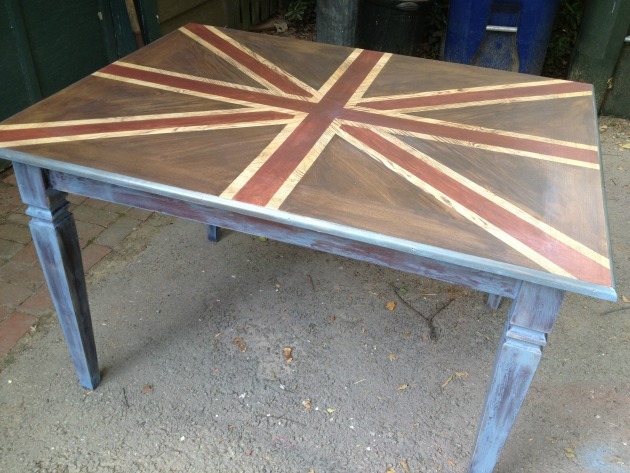 After seeing my union jack coffee table she was inspired to do the same thing to her extra table. It looks great and I love the overly distressed legs. 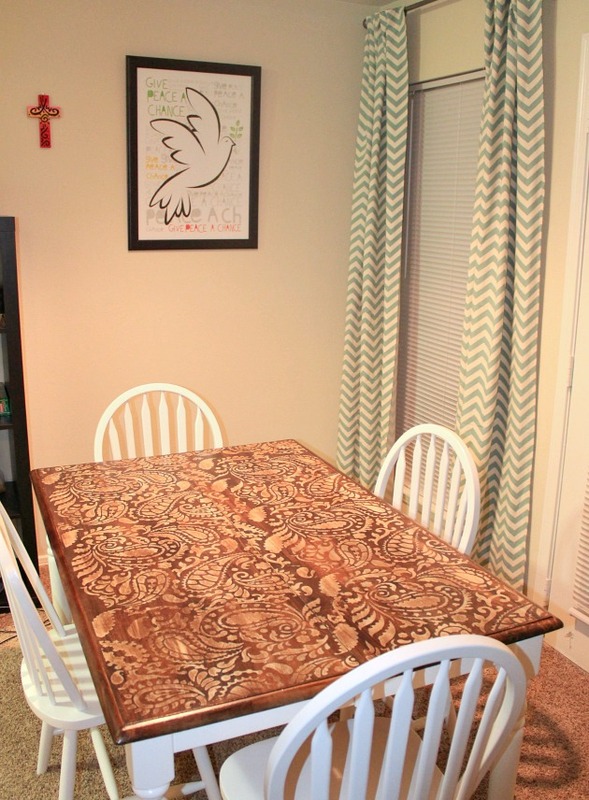 The paisley stenciled table my most popular post and the one that gets copied most often. I love that each person puts their own spin on it and each one I see if different and unique. So each one of the following projects was based on THIS POST. 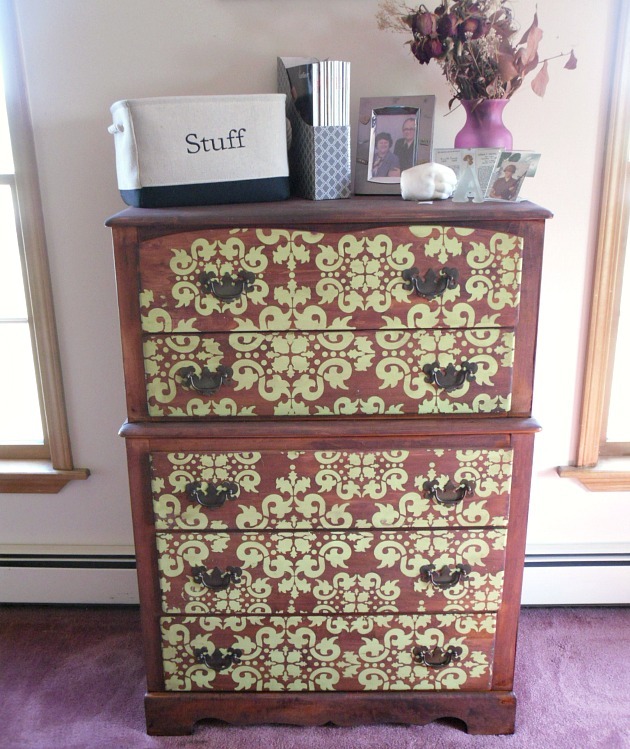 Ashley at The Freckled Redhead took an old dresser, sanded it down, stenciled it, and stained it. It looks great and you can read her tutorial HERE. I also love her completely honest basket that’s simply labeled “stuff”. 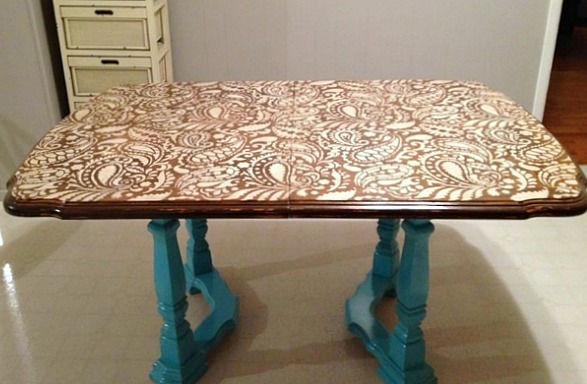 Amanda’s paisley table got a glossy finish, crisp turquoise legs, and looks amazing! 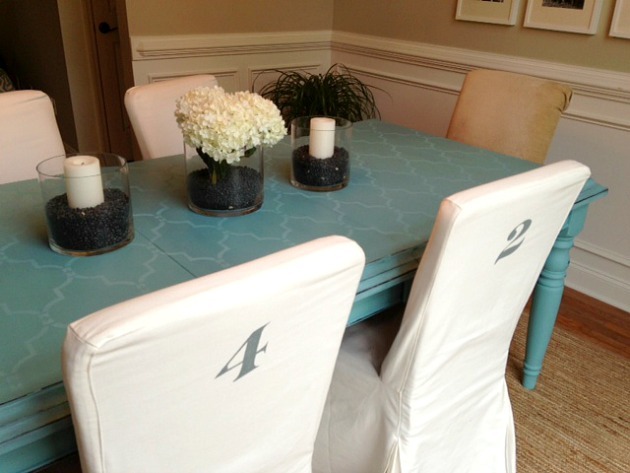 Laure at Reborn Rooms painted and stenciled her dining room table and numbered the barstools. I have to say that I am completely and totally in love with the final product! 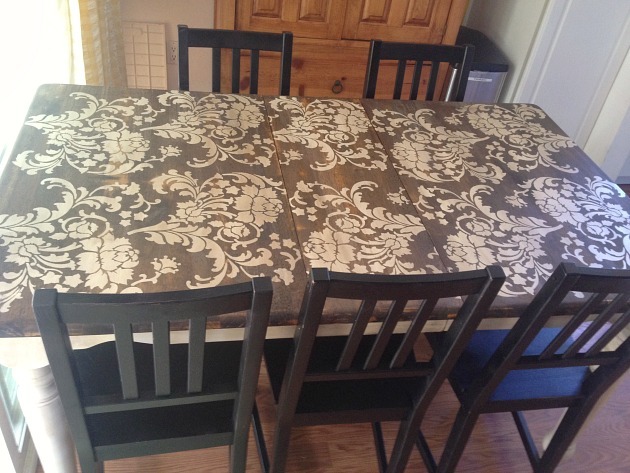 Cornelia of Two Thumbs found an old phone table on the side of the road and gave it new life! It looks amazing and you can read her post about it HERE. 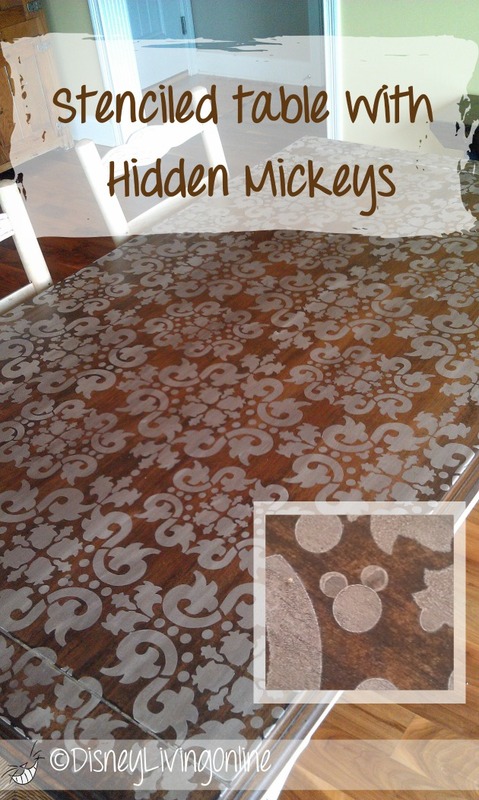 Amy of Disney Living Stenciled her table with a stencil from Hobby Lobby and even included hidden mickeys, one at each place setting. Read her tutorial HERE. Jennifer said it’s been a year since she stenciled her table and she’s not easy one it. It’s held up great! 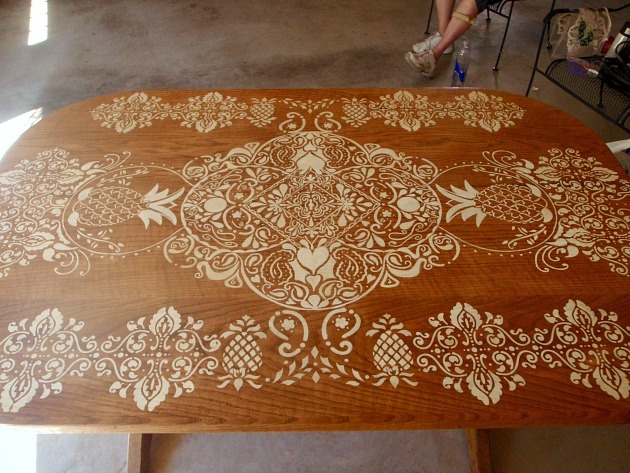 Cindy used a stencil AND hand painted parts of her table to create this intricate design. Isn’t it amazing? I love Jessica’s table not only for the stencil, but also for those awesome, rustic, chunky legs. 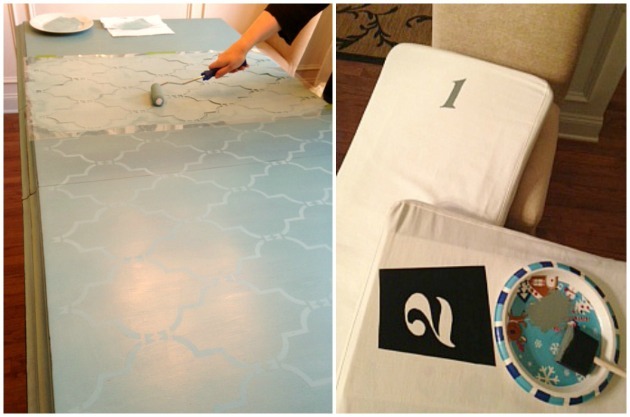 Beth from Sawdust & Embryos stenciled her table using a stencil she made herself! Beth and her husband Nick have a great DIY blog that you should really check out if you haven’t already. You can read her table tutorial HERE and her DIY stencil tutorial HERE. Amanda actually has two Domestic Imperfection projects in her dining room, her paisley stenciled table and the blue chevron curtains. I never had mine together in the same room but I think they’re a great pair. That’s it for today, hope everyone has a great weekend! Thank you to everyone who shared their projects! 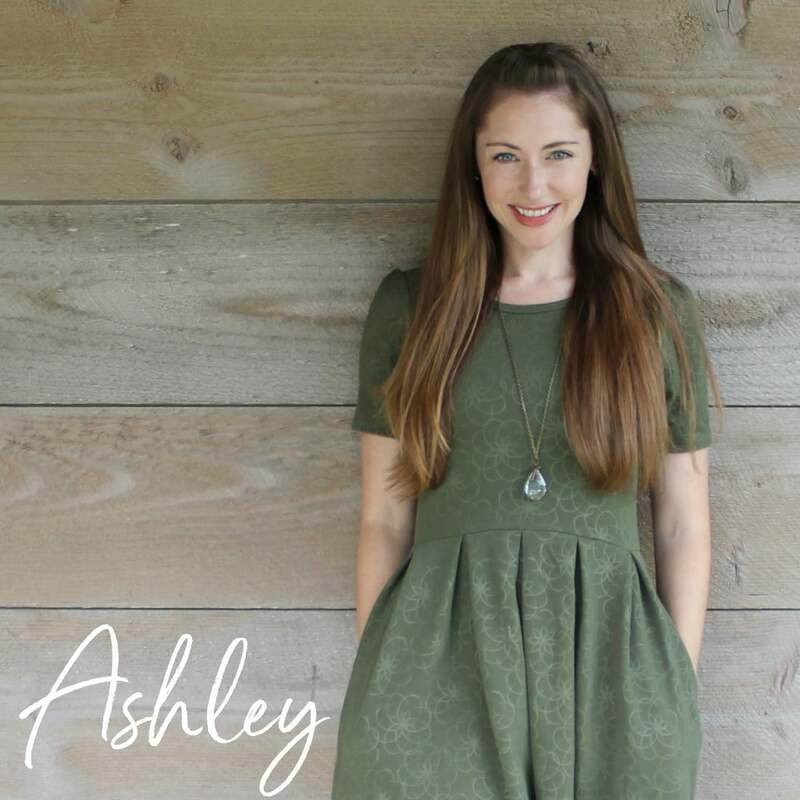 These are some great projects Ashley! Thanks so much for including me. I love the yardstick as moldings… so cute! You are such an inspiration. I’m actually thinking about applying the paper bag technique to my ugly concrete front porch. What do you think about how it would hold up outside? Hey Ashley, Isn’t it a great feeling to know how many you have inspired? You also inspired me to finally try a stencil project I have not blogged about yet, but I will soon and send your way, would love for you to feature. I think a monthly or so” Reader Projects” is a great idea! You know you inspired me to start my blog as well! I am enjoying it very much! Ashley…I keep going back to your kitchen/laundry. There are so many details loved. Plus other original projects not gotten to yet. .This may be late in the game for you, but about your ” kitchen rug”. An easy rug pad is a Yoga mat. It just won’t move around regardless of the floor material. And usually you can find someone who has a couple stashed away not used that may just gift them to you. Cut to fit, keeps moisture off the floor, great on the feet and can be washed if needed. If you need to add more than one under a rug for larger sizes, they just stay where you put them. No need to glue together, etc. I use this in my bath to keep water off the wood floors. Could never find a unique bath rug and their backing wasn’t always as moisture proof as needed. Wow, great idea! I have two runners, one in the kitchen and one in the hall, that badly need yoga mats – they are always sliding around. I hope I’m that talented at DIY work someday. The cabinet one was amazing!